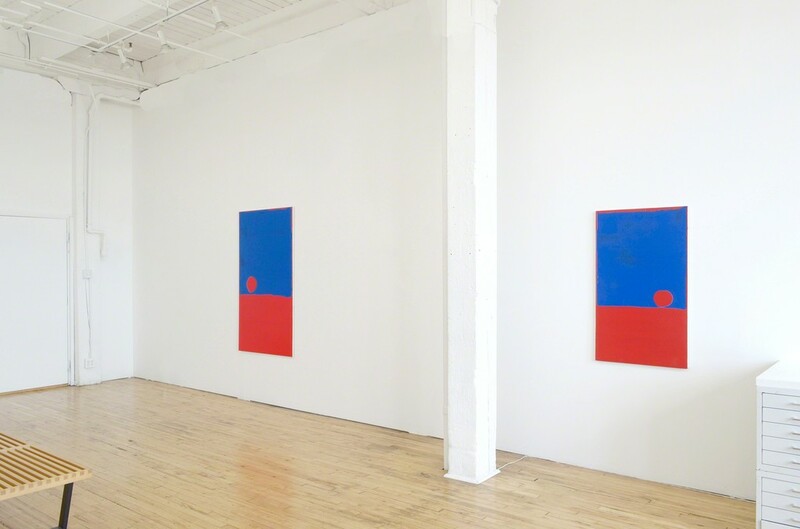 Devening Projects is pleased to present our second summer Cabinet exhibition showcasing Chicago artist Clay Mahn. 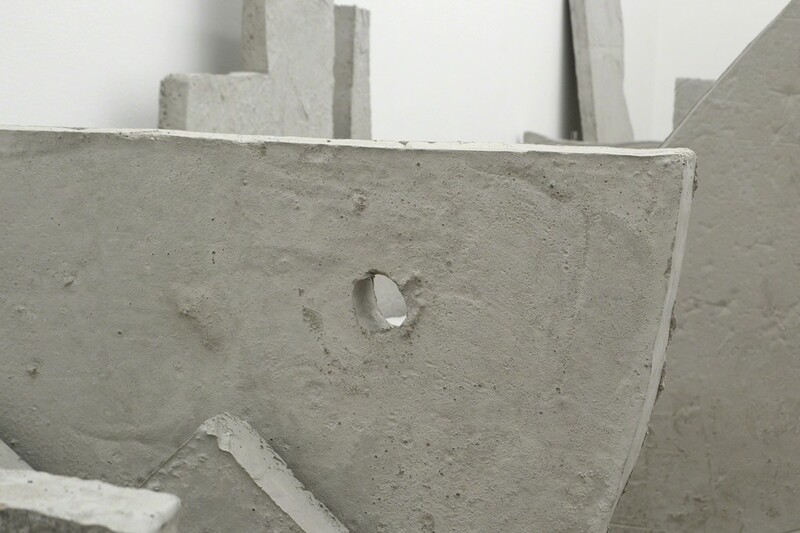 Clay has shown most recently at Paris London Hong Kong, our satellite gallery project, and at Gallery Weekend Chicago Expanded at Mana Contemporary in 2017. Softer Thoughts, his first solo show at Devening Projects, features a new series of paintings and an ambitious installation of recent sculpture. As a painter, Clay has consistently reduced his pictorial concerns to draw attention to the subtle elements of surface, edge and structure. 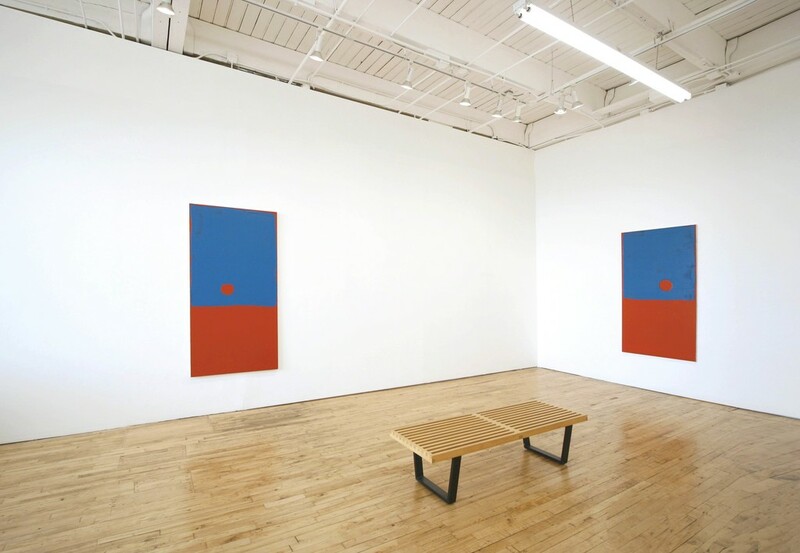 Compositional decisions in his mostly monochromatic canvases and panels keep the work well within a figure/ground conversation, but assumptions about object and space are always put into question. Like many artists engaged with Modernism, the notion of pure matter and painting is merely a starting point from which to consider many other aspects of painting’s topology. His interest in framing and boundaries is a way to both reiterate the picture plane and to reference other devices that focus perception. 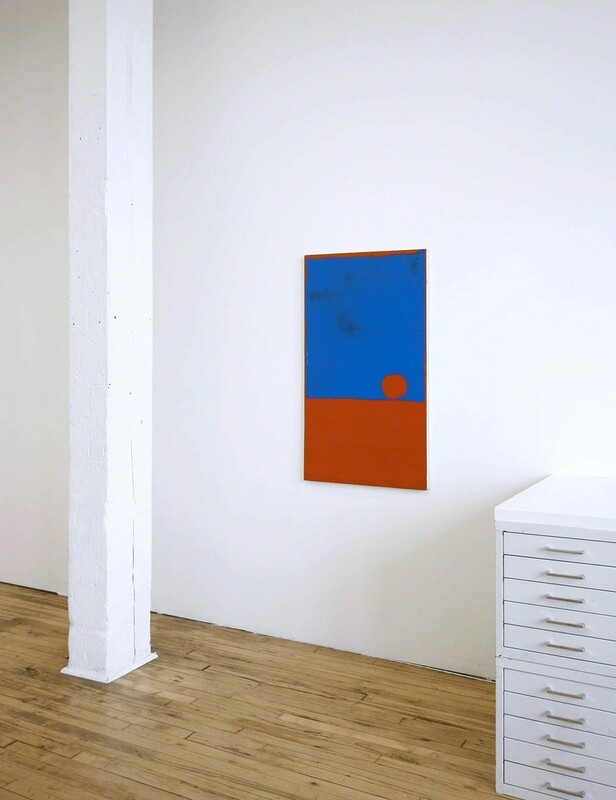 He uses windows, picture frames and textual margins to organize and subvert the trusted stability of the rectangle. A comforting sense of order and logic in Clay Mahn’s paintings willfully resists stasis to remain flexible and nimble. 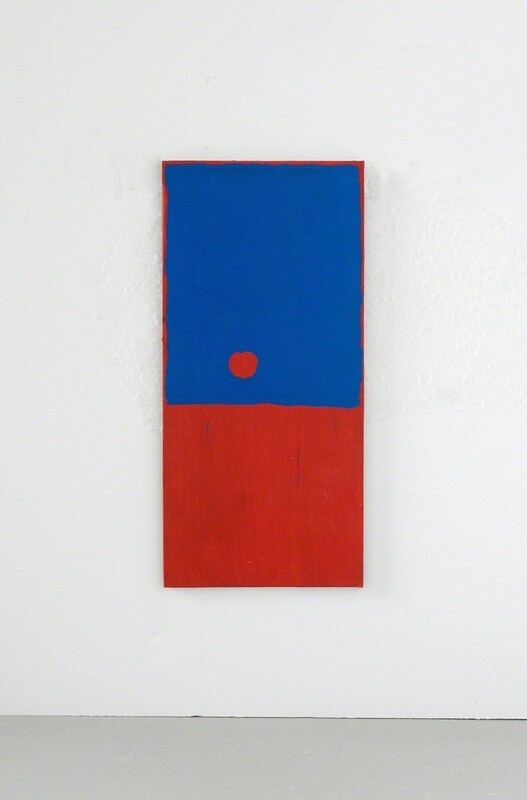 For Softer Thoughts, the artist brings a highly charged palette into play to heighten the work’s opticality and to ask new questions about associative color. References to landscape—particularly sunrises/sunsets—are almost clichéd in their allusion to familiar tropes in painting; but, like in all of his work, the read is not that simple. The landscapes are conjured by the simplest of designs and are physically present with intense, solid pigments pulled directly across the surface. 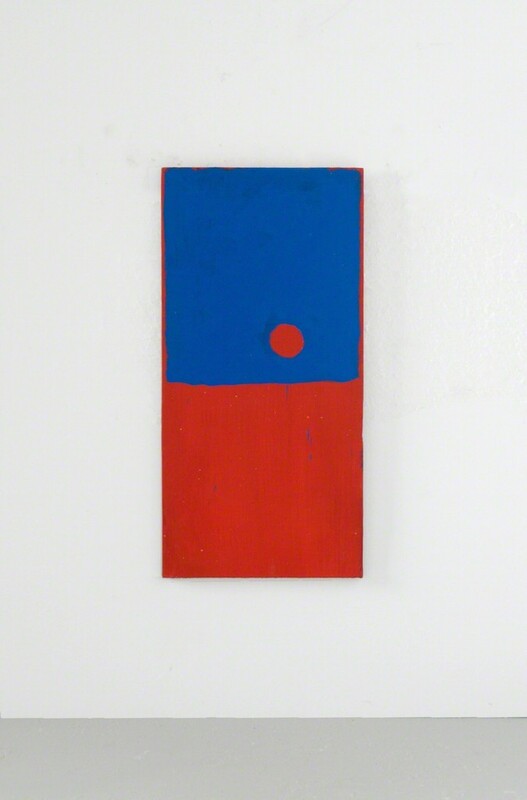 This work endears a sense of longing for nostalgia which is quickly subverted by aggressive color and materiality. The paintings frame a familiar scene; however, taking time to look and feel creates a different experience than what is assumed. 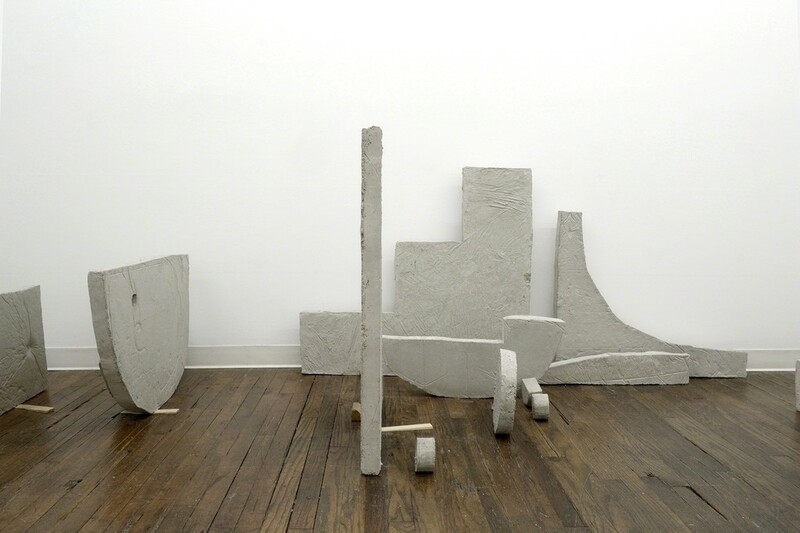 Applying his ideas about material, form and schematics to sculpture and installation, Clay stages his newest concrete sculptures within a context of modeling and theater. 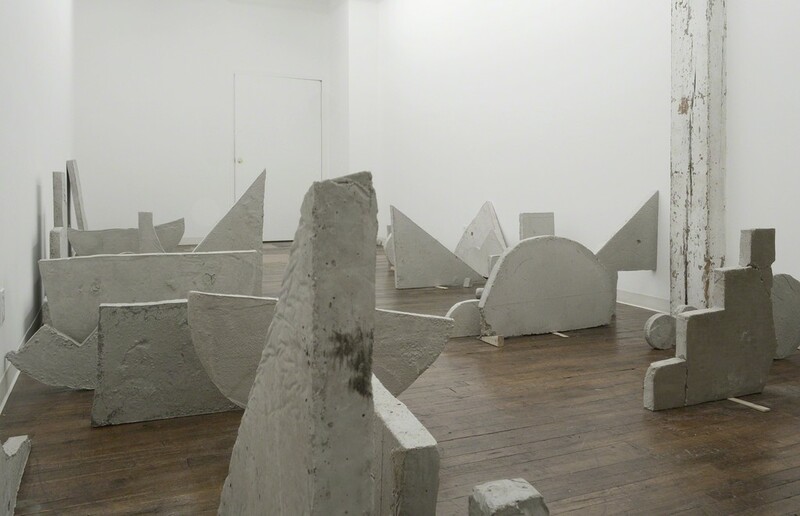 He carefully developed the concrete forms at a minor scale first, allowing him to easily play with placement, scale and order; the fully realized sculptures manifest the significance of weight, mass, volume and surface. 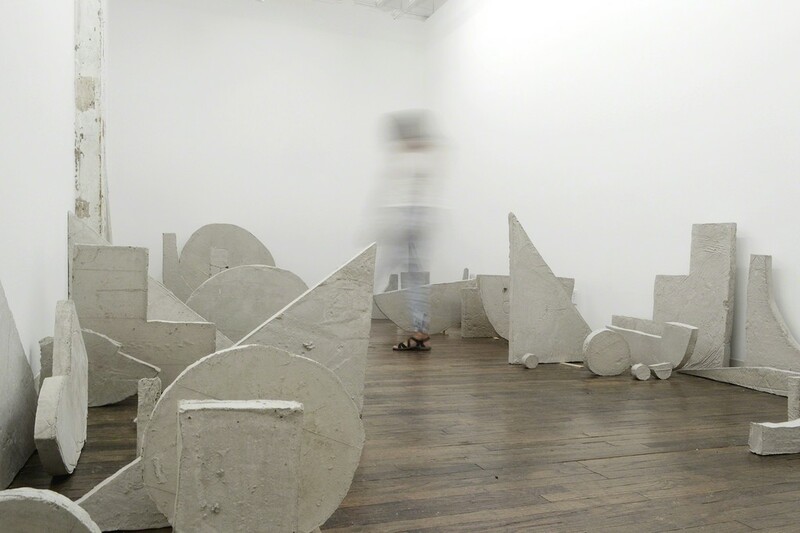 “Ground” and space contextualize his paintings; the heavy concrete sculptural objects become “figures” playing roles within the gallery setting. Playful and ponderous, they display an innocence of form—like a giant’s broken toys—and are also the ruins from the fall of some mysterious culture. The objects occupy and activate the rooms in the gallery while “asking” the viewer to interact, move, stack and reorganize them. Unlike his paintings that successfully hold us in place, these sculptures create a field of movement driven by curiosity to know more about their purpose and history. The manner in which the paintings and the installation create a panoramic totality is one of the many engaging elements of this ambitious exhibition. Clay Mahn was born in Missoula, Montana, and received his BFA from the University of Montana in 2012 and his MFA from the School of the Art Institute of Chicago in 2017. 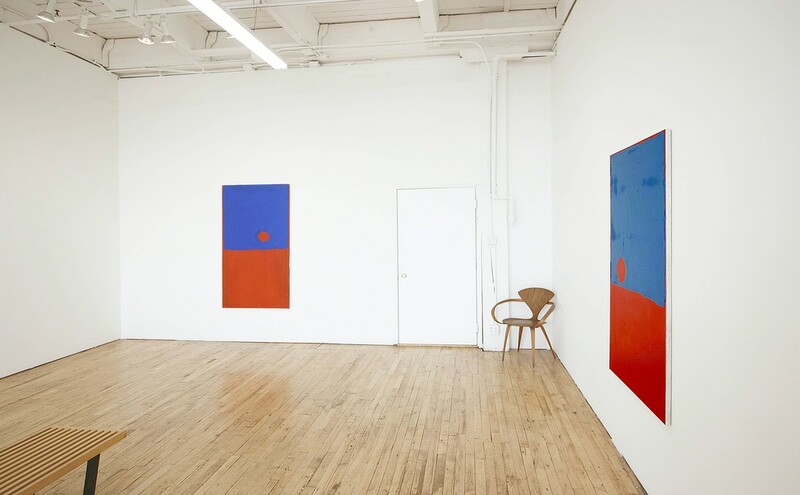 In addition to his shows at Paris London Hong Kong and Expanded, recent exhibitions include Bad Habits at False Front in Portland, Oregon; Left, Right, Left at TW Fine Art in Brisbane, Australia, and a two-person exhibit at PULSE Miami Beach with photographer Ryan James MacFarland.